A lady in a pink dress reclines on her side on a gently sloping grassy hill. In the distance are a couple of farmhouses grayed with age. Her hands support her in an awkward position: her left hand reaches forward, almost clawing the ground in front of her. Her right hand seems to push her body on. Her hips carry her weight, and her legs seem like a heavy load slowing her down from reaching the farmhouses at the horizon. She inches her way over the tawny grass. The distance appears unbearable. In her struggle both her isolation and her quiet determination are highlighted. This is the subject of the painting Christina’s World by Andrew Wyeth, one of the most famous paintings in the Museum of Modern Art in New York, part of the core collection donated by Alfred Barr, its founding director. 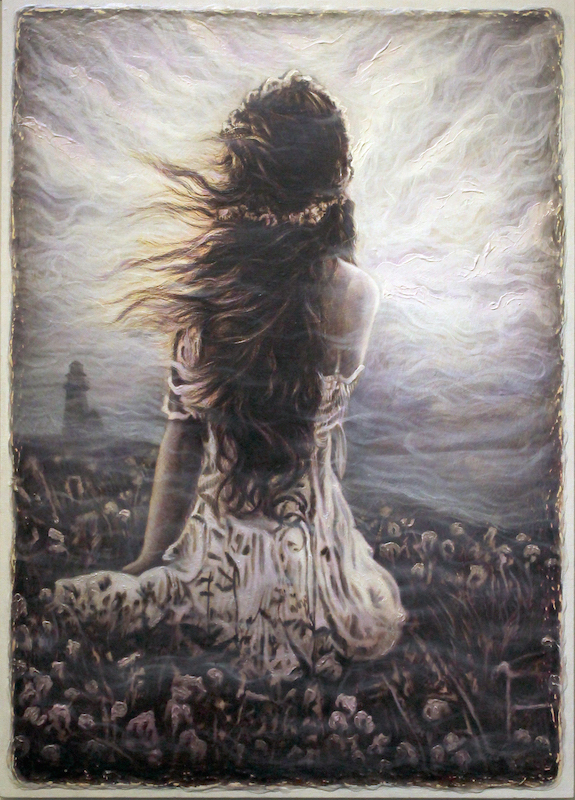 This well-loved painting portrayed both Christina and the landscape in a new light. Far from the bucolic farms that are romantically depicted in many paintings, and the pretty women portrayed in portraits, such as those of our beloved Amorsolo, Christina’s World evokes struggle and strength, thus breaking away from the academic and the traditional. 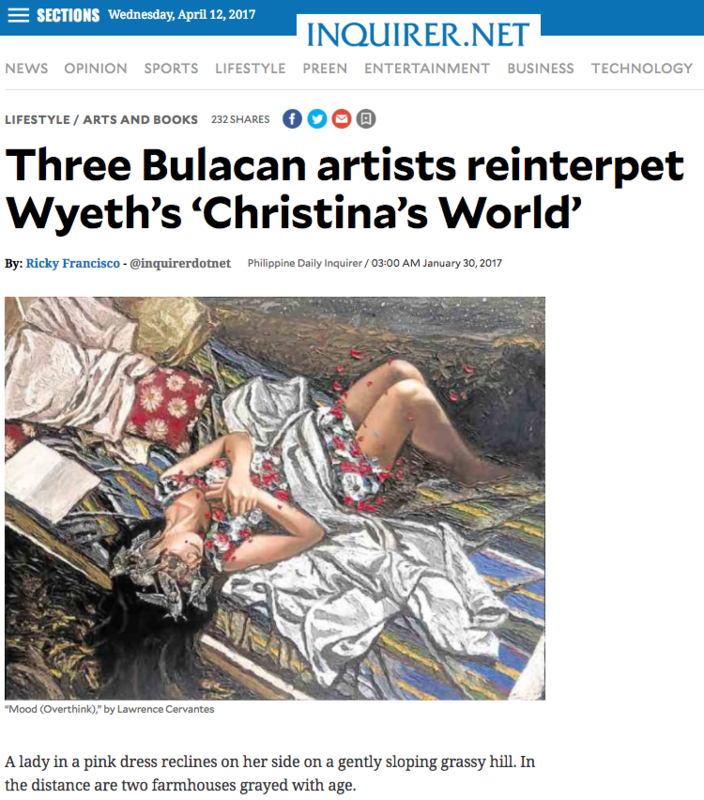 Three young artists from Bulacan reinterpret the oft-romanticized landscape and women as Wyeth has. The bucolic rice fields of Bulacan, and its industrious and pretty women, have been immortalized in many of Amorsolo’s early works. Amorsolo’s first wife was a Bulakenya, and they had a small house there where Amorsolo would go to rest and paint in between his thriving practice and day job in Manila in the early 1930s. Views from and of their house, taken from different directions and distances form a template of a rural scene for many of Amorsolo’s paintings, such as the “Sunday Morning Going To Town” and “Feeding the Chicken” from the Ayala Museum collection are of that house with a view of the rice fields, a bamboo grove, a suspended vegetable trellis and a verdant mango tree. The vista has been replicated in countless other works by the master, and by the students who emulated him. Generations of painters have impressed on us that Bulacan is like a Filipino “Shire” from Tolkien’s Lord of the Rings Trilogy, with its pleasant hardworking folk, and unchanging peaceful landscape producing bountiful harvests. Both Bunag and Quizon focus on farmhouses, not Filipino nipa huts or bahay na bato, but Wyeth’s grey farm houses and solitary women. 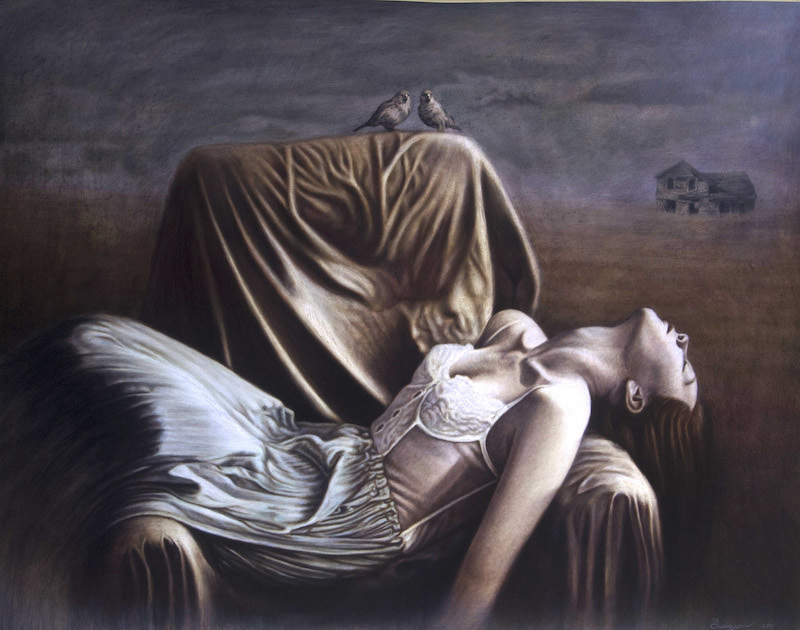 Their works are rendered in somber tones grey, sepia, and tints of white. Each work focuses on a house or a woman, rendered almost picture-like in both artists excellent draftsmanship. 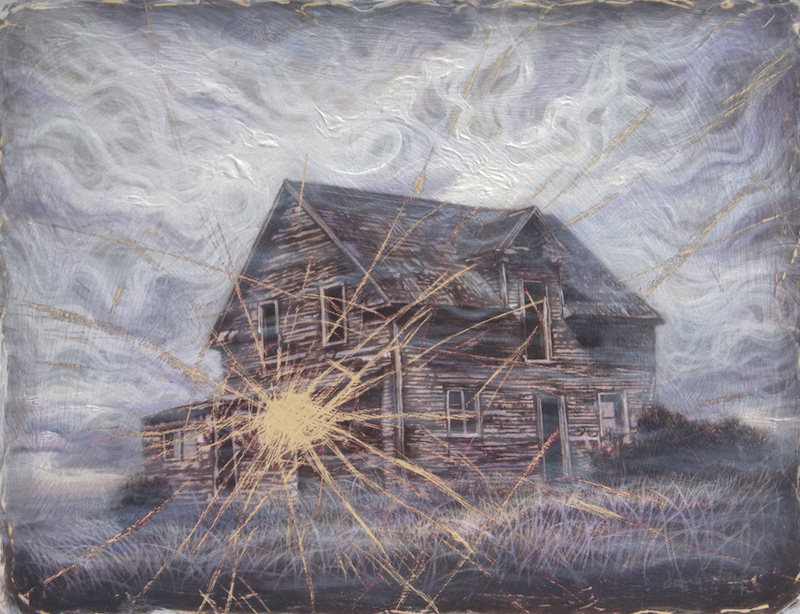 Bunag breaks the verisimilitude by intervening and breaking the picture as it were a framed photograph punched and smashed, with impact marks and cracks and losses on the image, adding to the ominous mood of each work. A broken landscape which breaks away from tradition by drawing attention to its maker rather than the image itself. 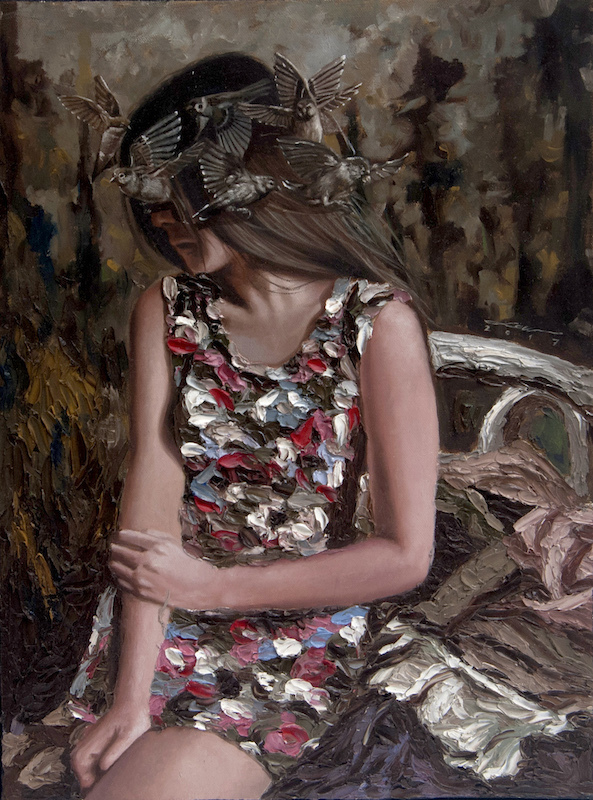 Confidence can be gleaned from the works of this constant art competition winner. 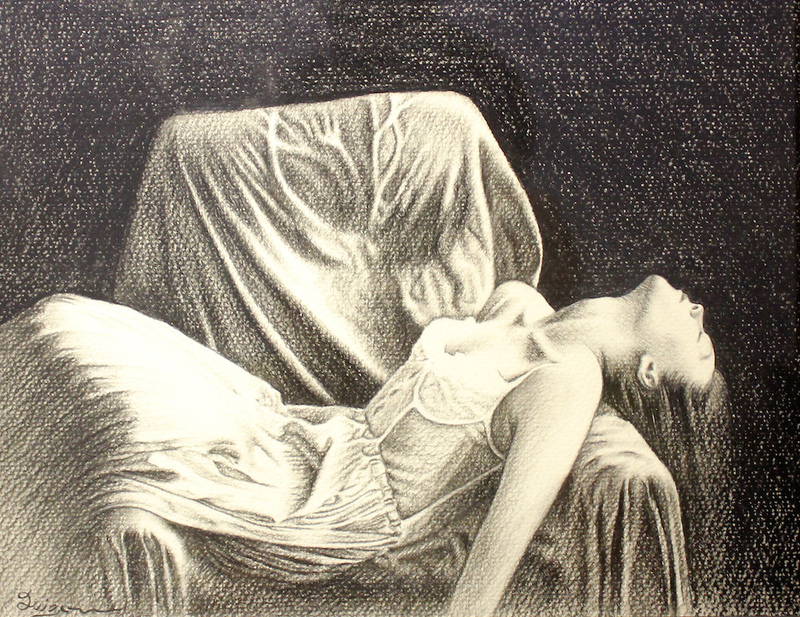 Quizon, for his part, depicts women limply reposing on seemingly misplaced sofas in the field. 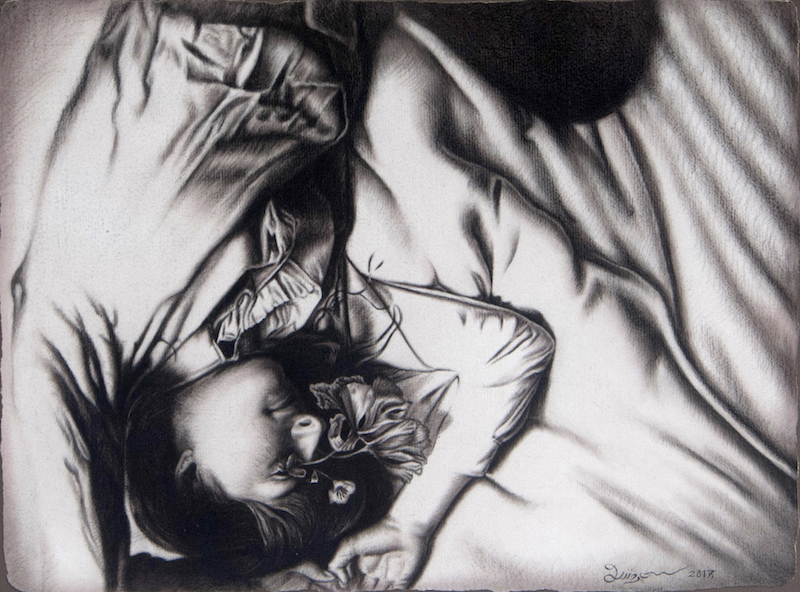 Care is given to exquisitely mimicking the folds and creases of real cloth, which provide focus on their delicately drawn subjects. The landscape, with its burgeoning clouds provide the backdrop for the mystery that shrouds each work. In his composition, the landscape with its swirling clouds and grasses bowing in the wind is ironically more active than the still subjects who are captured in repose. Cervantes makes use of magic realism in portraying his posed female subjects. Each work is rendered in a palette of red, white and shades of blue, contrasted against backdrops of beige, brown and ash. The clothing of his subjects are painted in heavy impasto. Their hands are crossed, seemingly implying vulnerability and uncertainty. Their eyes covered by a small flock of the common brown maya birds which pick grain from the fields. The three are among the most promising of the crop of new artists emerging from Bulacan. 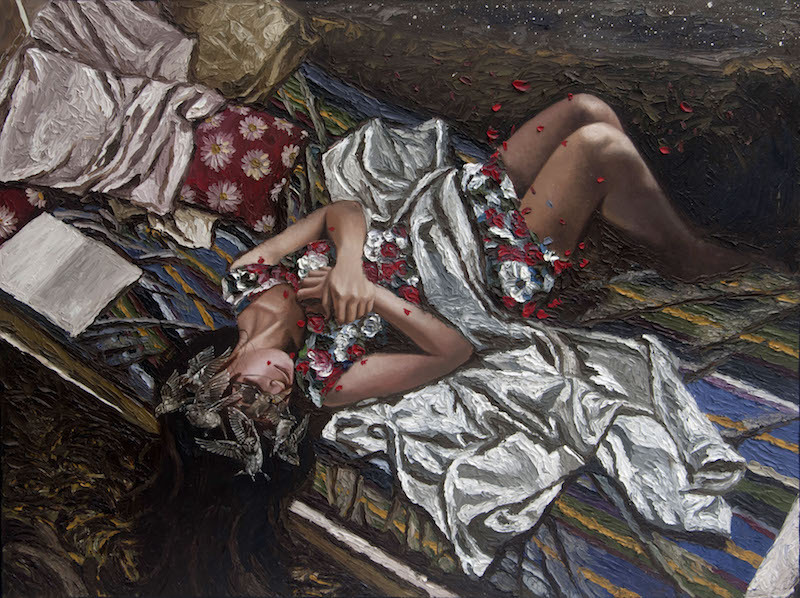 Championing realism in their works, these three artists pay homage to the tradition started by Amorsolo by keeping his technique for imitating what can be seen, but solidly break away from it through the subjects they paint and the nostalgic and even oppressive landscapes they have painted. 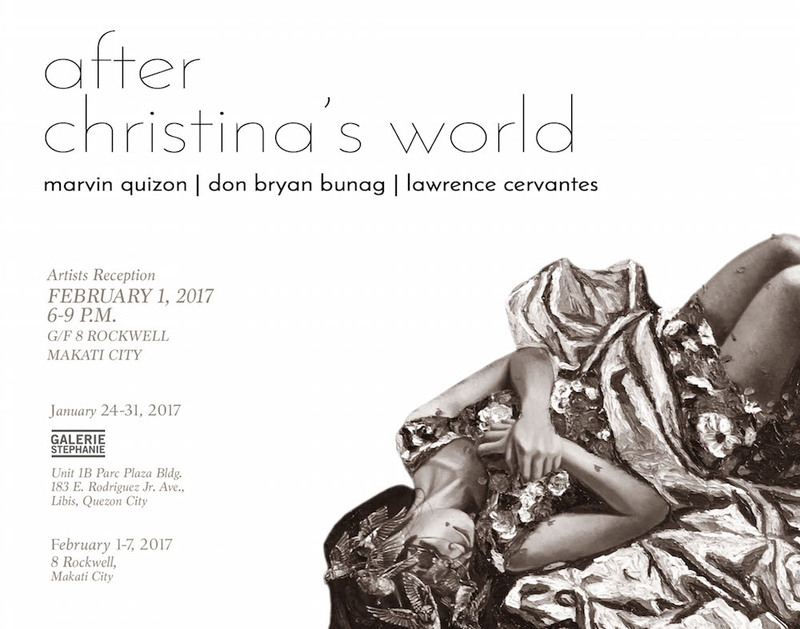 After Christina’s World opens on February 1, 2017 at the pop up gallery space of Galerie Stephanie, located on the Ground Floor of 8 Rockwell Building, Rockwell Center, Makati City. It will be on view there until February 7. For inquiries, call Galerie Stephanie at (02) 709 1488 or send us an email at inquiry.galeriestephanie@gmail.com.